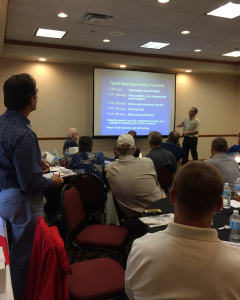 Each time weather reports and news stories warn of impending heavy rains and hail, the Hail Investigation Program (HIP) Committee of the Roofing Industry Committee on Weather Issues (RICOWI) Inc., Clinton, Ohio, begins a process to determine whether the hail damage is sufficient to meet the HIP requirements for deployment of volunteer research teams. Before the daily assignments began, the volunteers reviewed the various research requirements, met their team members and learned their responsibilities. Mobilization criteria is met when “An event is identified as a hailstorm with hail stones greater than 1 1/2 inches in diameter causing significant damage covering an area of 5 square miles or more on one of the target- ed areas.” Once a storm that meets the criteria has been confirmed and meteorological data and local input have been obtained by HIP, a conference call with RICOWI’s Executive Committee is held to discuss HIP’s recommendation and review information. The Executive Committee decides whether to deploy. On April 11, 2016, the hailstorm that damaged the Dallas/Fort Worth metroplex met the requirements for mobilization. Volunteer recruitment is an ongoing process throughout the year. RICOWI members are encouraged to volunteer as a deployment team member by completing forms online or at HIP committee meetings held twice a year in conjunction with RICOWI seminars and meetings. Once a deployment is called, an email is sent to RICOWI members to alert the volunteers and encourage new volunteers. RICOWI sponsoring organizations also promote the investigation to their memberships. Volunteers are a mixture of new and returning personnel. On May 2, 2016, 30 industry professionals traveled from across the U.S. to assemble in Texas. These volunteers were alerted to bring their trucks, ladders and safety equipment. To provide an impartial review, 10 teams of three volunteers were balanced with roofing material representatives, roofing consultants or engineers, meteorologists, contractors and researchers. Team members volunteered to be their team’s photographer, data collector or team leader. When the deployment was called, press releases were sent to various media in the Dallas/Fort Worth area to alert local companies and homeowners of the research investigation. RICOWI staff began making calls immediately to the local area’s government officials to seek approval for the investigation teams to conduct research. Staff also made calls throughout the research week to help identify additional buildings. A large area in and around Wylie, Texas, had hail as large as 4 inches in diameter. Several methods are used to help determine which areas and roofs are chosen. A list of building permits were provided to RICOWI by local building officials to assist with roof choice. In addition, one of RICOWI’s members from the area did preliminary research and provided addresses for the teams. These site owners were contacted through phone and email to notify them of the research project. Teams were assigned low- or steep- slope research and were assigned addresses accordingly. Team members carried copies of the press release and additional information to help introduce the investigation to business owners and homeowners. 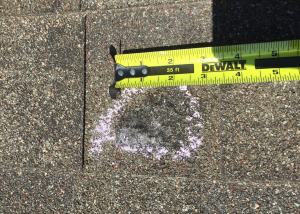 Investigate the field performance of roofing assemblies after this major hail event. Factually describe roof assembly performance and modes of damage. Formally report the results for substantiated hail events. Before the daily assignments began, the volunteers reviewed the various research requirements, met their team members and learned their responsibilities. The teams were briefed on safety, how to take proper photos and how to capture important data. As each day began, a briefing was held providing assignments for the day. This included addresses for investigation based on whether the team was focused on low- or steep-slope research. The teams were encouraged to stop at other homes and facilities that were undergoing roof repairs in addition to their assigned inspections. The days were hot and long for the teams. Volunteers began each day at 8 a.m. and many did not return until 5 or 6 p.m., depending on the number of roofs they were assigned. The temperature during the day was around 80 F and humid; the temperatures on the roofs were much worse.